La Prairie is a city in Itasca County, Minnesota, USA. The population was 665 at the 2010 census. U.S. Highways 2 and 169 are two of the main routes in La Prairie. A post office was in operation at La Prairie from 1890 until 1917. The community was named after the nearby Prairie River. According to the United States Census Bureau, the city has a total area of 1.69 square miles (4.38 km2), of which 1.64 square miles (4.25 km2) is land and 0.05 square miles (0.13 km2) is water. La Prairie is adjacent to the city of Grand Rapids. As of the census of 2010, there were 665 people, 270 households, and 184 families residing in the city. The population density was 405.5 inhabitants per square mile (156.6/km2). There were 287 housing units at an average density of 175.0 per square mile (67.6/km2). The racial makeup of the city was 91.6% White, 0.6% African American, 2.9% Native American, 0.2% from other races, and 4.8% from two or more races. Hispanic or Latino of any race were 0.9% of the population. There were 270 households of which 30.4% had children under the age of 18 living with them, 54.1% were married couples living together, 10.7% had a female householder with no husband present, 3.3% had a male householder with no wife present, and 31.9% were non-families. 27.4% of all households were made up of individuals and 12.6% had someone living alone who was 65 years of age or older. The average household size was 2.39 and the average family size was 2.86. The median age in the city was 41.8 years. 24.5% of residents were under the age of 18; 7.2% were between the ages of 18 and 24; 21.5% were from 25 to 44; 28.2% were from 45 to 64; and 18.8% were 65 years of age or older. The gender makeup of the city was 49.3% male and 50.7% female. As of the census of 2000, there were 605 people, 239 households, and 174 families residing in the city. The population density was 532.0 people per square mile (204.9/km²). There were 249 housing units at an average density of 218.9 per square mile (84.3/km²). The racial makeup of the city was 98.35% White, 1.32% Native American, and 0.33% from two or more races. There were 239 households out of which 32.6% had children under the age of 18 living with them, 60.3% were married couples living together, 9.2% had a female householder with no husband present, and 26.8% were non-families. 20.1% of all households were made up of individuals and 4.6% had someone living alone who was 65 years of age or older. The average household size was 2.50 and the average family size was 2.90. In the city, the population was spread out with 25.1% under the age of 18, 7.8% from 18 to 24, 26.3% from 25 to 44, 27.9% from 45 to 64, and 12.9% who were 65 years of age or older. The median age was 40 years. For every 100 females, there were 106.5 males. For every 100 females age 18 and over, there were 103.1 males. The median income for a household in the city was $39,375, and the median income for a family was $50,250. Males had a median income of $41,125 versus $23,681 for females. The per capita income for the city was $18,632. About 7.7% of families and 10.0% of the population were below the poverty line, including 9.8% of those under age 18 and 15.3% of those age 65 or over. ^ "2010 Census Redistricting Data (Public Law 94-171) Summary File". American FactFinder. U.S. Census Bureau, 2010 Census. Archived from the original on 26 July 2011. Retrieved 23 April 2011. 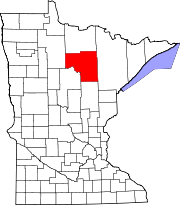 ^ "Itasca County". Jim Forte Postal History. Retrieved 12 July 2015. ^ Upham, Warren (1920). Minnesota Geographic Names: Their Origin and Historic Significance. Minnesota Historical Society. p. 255. This page was last edited on 6 April 2019, at 21:44 (UTC).